tastes.That would strike a balance! But until then, it means I get to cook and savour them alone. This ‘’curry’’ is one such dish which has been in my drafts for a while now. I make no claims that this is an authentic Indian curry. But is certainly delicious, comforting and easy to make. I take full advantage of kids not eating this and add some extra chillies to it. The cool raita makes a wonderful accompaniment to it. The walnuts add a lovely crunch. With steaming white rice, it makes a hearty meal. 200 gms Mushrooms, washed, and quartered I used mushrooms. Any variety will do. 1. Heat 1tbsp oil in a pan or skillet. Saute the mushrooms for about 5 minutes until tender. Keep mushrooms aside. 2. In the same pan, heat a tsp of oil, Add onions and fry for 3-5 minutes on low/medium heat. Add ginger, garlic and green chilli for the last 2 minutes. 3. Add bellpepper and fry for a minute. Add tomato and cook for a few minutes until soft and mushy. 4. Add the mushrooms, garam masala, salt, sugar and mix well. Saute for 2 minutes. 5. Add coconut milk and a bit of water to lighten the consistency if you like. Bring to boil and switch off heat. Garnish with coriander leaves. 1. Mix the first five ingredients together in a bowl. 2. Heat oil in a small pan. Add red chillies if using and mustard seeds. Once they start to spultter, lower the heat and add urad dal and curry leaves. Take off from heat and pour onto the raita. Garnish with coriander leaves and crushed walnuts. This looks amazingly delicious! Fantastic photography too! Curry looks so good. And ilove the pic. Woaa, interesting raita and curry sure looks good. The pictures are so good especially the mushrooms, they look gorgeous. Thanks Ash..mushrooms happen to be one of my favourite subjects wrt photography. Love their texture! That looks so good and wholesome! Love the photographs. 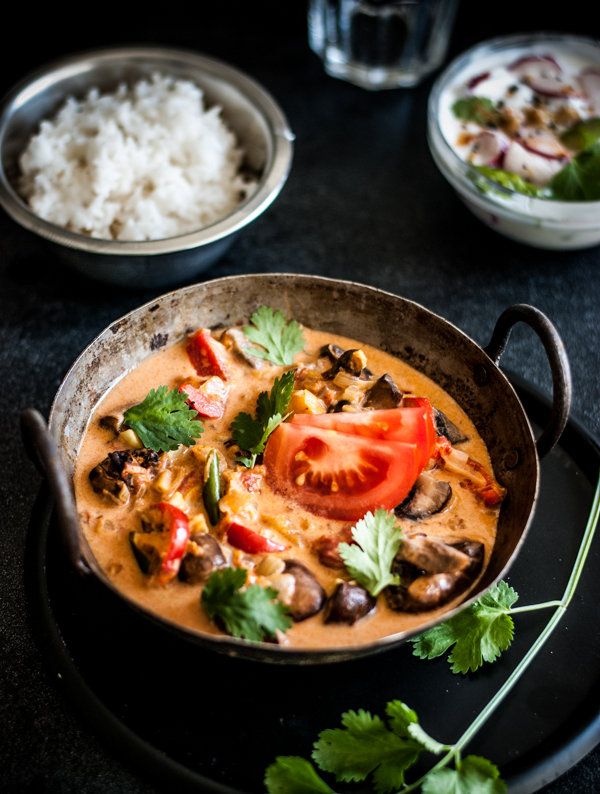 Im a big fan of mushrooms - and mushroom curries. Love the use of coconut milk! awesome...fantastic ...I don't have any word to describe your photography. awesome I have tried, and I love to enjoy reading and learning new things. Thanks for share and keep it up. this came up after i googled what was in my fridge and the word "curry". i didn't have asparagus. i use dark maple syrup as a sweetener in raita. and i had oyster mushroom on hand. it was soooooo good! thank you for your creative cooking and sharing! Thank you for visiting. I'd love to hear your thoughts!